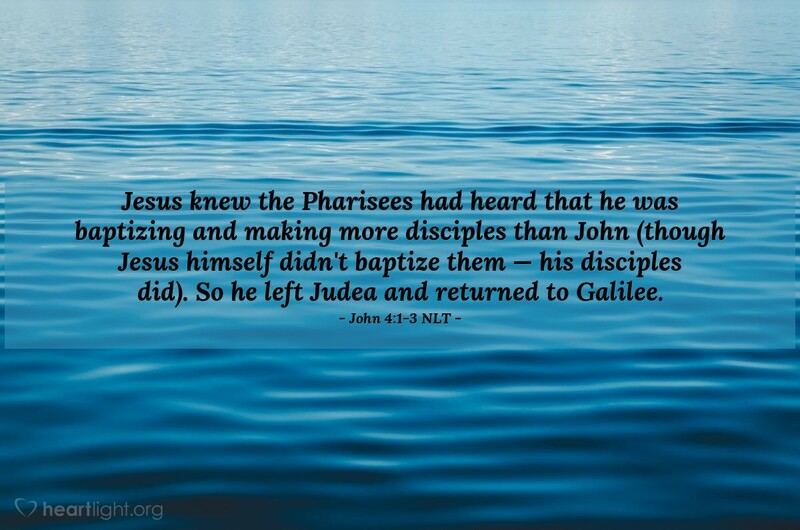 Jesus knew the Pharisees had heard that he was baptizing and making more disciples than John (though Jesus himself didn't baptize them — his disciples did). So he left Judea and returned to Galilee. Jesus' ministry with his disciples involved baptizing. However, because of John the Baptizer's association with baptism, Jesus carefully avoided conflict and confusion. While he highly regarded John's ministry and John personally, he did not want to be confused with John. John was not the Messiah. Jesus was. John was not the Son of God. Jesus was. John was not the Savior of the world. Jesus was. John was not the King of Israel. Jesus was. In fact, Jesus still is Messiah, Son, Savior, and King. But to avoid confusion and conflict, to follow God's timetable and not the world's expectations, Jesus went back to Galilee, where he had grown up (Luke 2:39-40). Father, I know there are all sorts of conflicts that go on today between religious leaders and their followers. Please help me to value those who have given their lives to sharing the truth of Jesus. At the same time Father, please protect me from infatuation with these messengers and keep my heart focused on your message, Jesus the living Word, in whose name I pray. Amen.